Stanislav Konenko and Anatoly Konenko (57) from Omsk, in Russia, had created a fish tank measuring 30 mm in width, 24 mm high and 14 mm deep and can hold 10 ml of water – the equivalent of two teaspoons. 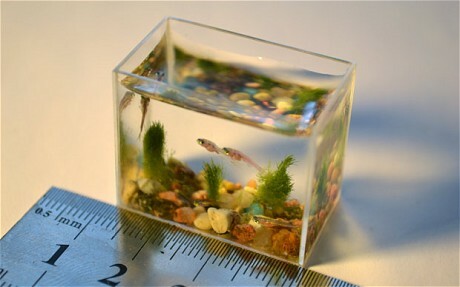 It still contains plants and stones and is the home of some tiny zebra fish, which were added to it using a miniature net. A syringe had to be used to fill it up with water to avoid disturbing the arrangement.